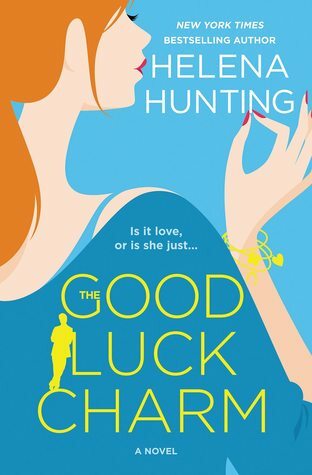 The Good Luck Charm is Helena Hunting’s newest standalone romance. I’m a huge fan of Helena’s and I don’t even read her synopsis’ anymore, I just get the book. I always know I’m going to get all the feels when I read one of her books. The writing is top notch, the characters well developed and witty and the storyline addicting. The Good Luck Charm delivered all of that plus extra heat and a little more angst. Ethan left home eight years ago. He was chasing his dream of playing professional hockey, but he left the love of his life. Now he’s back home and he wants her back. Lilah moved on with her life. She has a job she loves, friends and a sister who she’s close with. Even a nice house and a dog. She doesn’t want to hear Ethan’s excuses. She’s still so mad at him for the way he ended things. He’s not going to be deterred though. He’s going to romance her and win her back. Lilah can’t stop the way she feels about Ethan. They have so much history and it’s not all bad. Her body is way ahead of her mind though. She tries to fight it, but fighting Ethan is worthless. He’s the love of her life. But when he starts to need her more and more and she starts to lose herself again, she has to do something. Is she just Ethan’s good luck charm? Is he using her? I really enjoyed the relationship between Ethan and Lilah. They are both hard working, determined and a little crazy! I love the relationship she has with her sister and Ethan’s parents added in another layer which I really loved. Second chance romances are my favorite and this one made me laugh, cry, get mad, swoon and had me saying “I didn’t see that coming!” Looking forward to more from Helena! !